Bayview sink vanity is corner unit specially design for a smaller bathroom. This piece is carefully handcrafted of sturdy wood and finished in a lite walnut color. 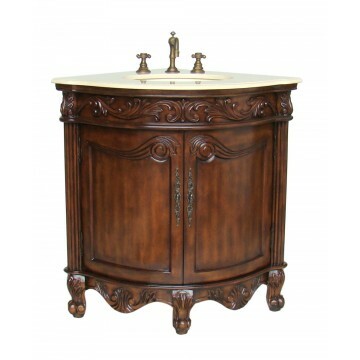 Its striking appearance will bring delight to any bathroom furnishing. Lite Cream color marble counter top is made of the highest quality that will resist prolonged exposure to humid conditions and long life durability. Biscuit color under mount porcelain sink and the faucet are included in our great low price.